The brands have been publicly duking it out for seven weeks. Don't they have anything else to do? Isn’t it about time for beer brands Bud Light and Miller Lite to share a round and call a truce? Now in its seventh week, the beer battle between the two brands is showing no sign of slowing down. Miller Lite created two spots imagining what happened on-set after Bud Light’s Super Bowl LIII ad stopped filming. 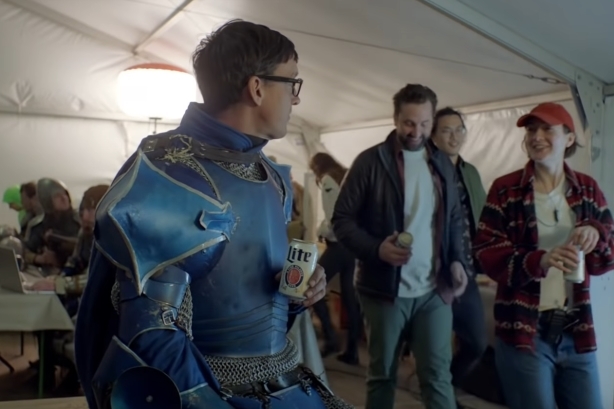 In the MillerCoors brand’s retelling, the actors, including the guy playing the Bud Knight, choose cans of Miller Lite over Bud to drink during a break. Bud Light simultaneously released a spot with the "Dilly Dilly" king saying he’s been made aware of Miller’s ad. "If you’re this set on imitating our kingdom, may I suggest also imitating us by putting an ingredients label on your packaging," he said in the spot. The beer brands have been brawling since Bud Light’s Super Bowl LIII ad took a shot at Miller Lite and Coors Light for including corn syrup in their ingredients. Are you loving the drama? Or is it time for the public feud to finally come to an end? Are you tired of the #corntroversy brewing between Bud Light and Miller Lite?